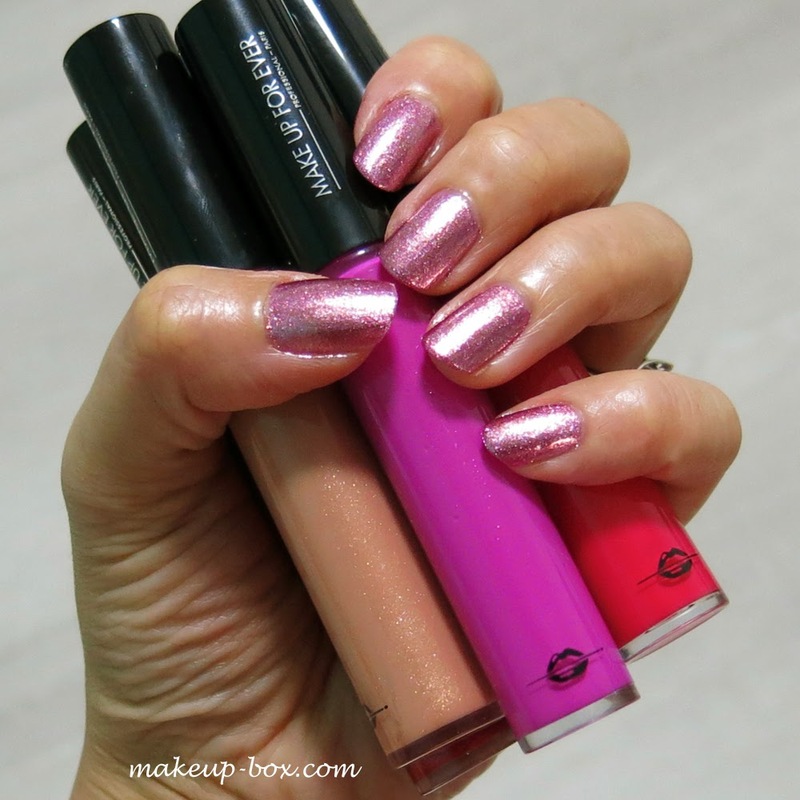 Make Up For Ever is replacing their existing lipgloss range with the new range of Plexi-Glosses from 2 April 2015, which will be available in 35 shades at the Pro Loft, and smaller color selections at all Sephoras in Singapore. The new line promises high shine, extreme color, and great staying power, and I received 5 shades for review, so I'm swatching them all below, and giving you my thoughts on whether it delivers on the 3 promises above. The new gloss comes in standard plastic tubes but has a rather interesting doe-foot applicator. This has been dubbed the Superflex applicator, and has an extended "flap" on one side which allows you to apply a bit more product in one swipe, and is slightly more flexible so the applicator won't also swipe the gloss right off your lips. At certain angles yes. You can definitely get a lot more product on your lips than typical applicators. 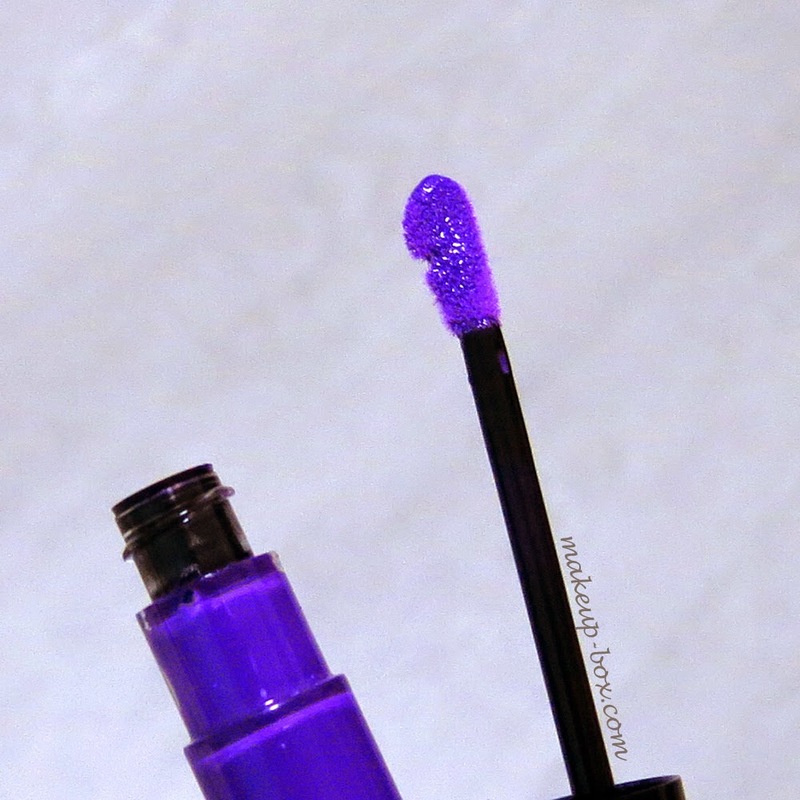 But if you get the angle wrong, the applicator will still swipe away some gloss just like regular applicators. So it's a hit and miss, although it's still a nice gesture because it does cut the amount of time you need to spend dipping back into the tube for more product. The colors. Now they DEFINITELY deliver on the promise of vibrant, intense color. Not all of them are opaque. It depends which shade you choose. But as you can see above, with the exception of the translucent sparkly beige (which is meant to be transparent), the rest are incredibly color-true and you can wear this on the lips without a base shade or liner. You can click on the image below to expand to a larger size for a closer look at each shade, but I'm pretty darned impresswed with the color payoff. I typically do not like shimmery sparkly glosses, but I have to say the ones I tried were really nice. I do have to point out that the very intense violet does stand out from the skin, which also makes it a bit more obvious where it settles into grooves on the lips, or may not be completely even. Not every shade works well on its own, and if you are ordering or purchasing any of the deeper colors in a non-sparkly texture, you should probably wear them over a layer of liner or lipstick. And the shine? Well these sort of speak for themselves. They look like lacquer. Shine is definitely where this range excels without a doubt. The staying power is also great for glosses. Definitely on par with the typical cream lipsticks at least. But that does bring me to the one possible con about this product depending on your preferences when it comes to glosses. It's sticky and quite thick. (If you've ever tried MAC Pro Longwear Lipglasses, these have a similar texture.) Which it needs to be, to stay on for hours and not bleed everywhere. But if you like those ultra-light, non-sticky glosses this will not appeal to you. You have to remember that if you have chapped, flaking lips, this will not feel comfortable. These thick gel-textured glosses are not moisturizing or balm-like, so it can actually make flaking lips a bit worse. Just be mindful and use the appropriate products at the appropriate times, and you'll be fine. 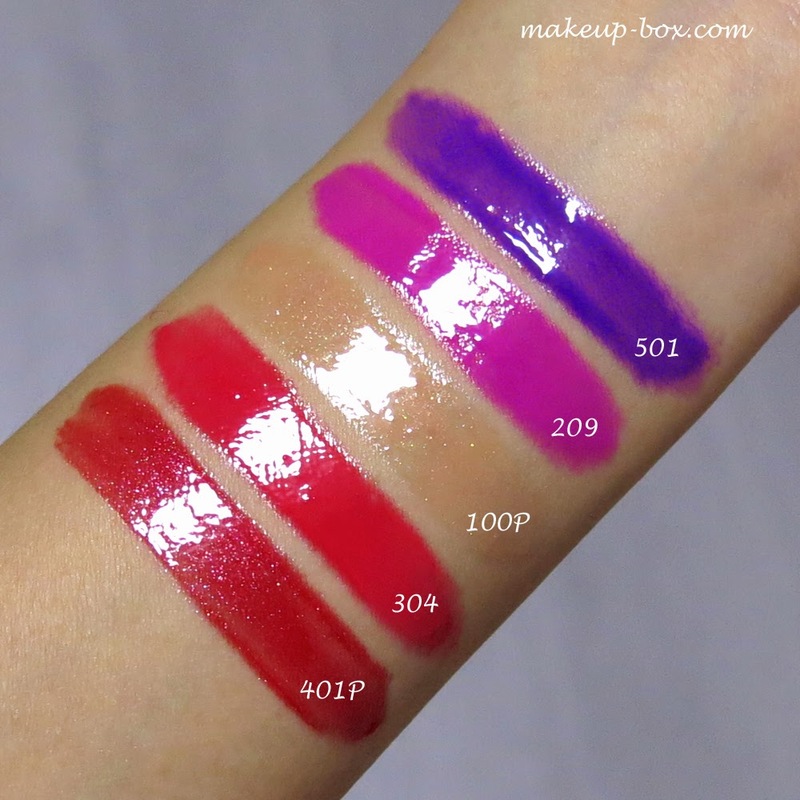 If you like high-intensity glosses in a variety of finishes, and you want to make a statement with lacquered, dramatic lips, this is a GREAT range. The color selection is fabulous, and you can pick from soft neutrals to bright corals and violets to dark plums and what looks like a black shade. I'm definitely curious to check out more colors from the range. I would especially recommend the richer pinks, corals, reds and plums, because these are where the color intensity and shine will really come through. For the paler, sheerer shades, they wouldn't necessarily look all that different from regular glosses you can get from other brands. At SGD36 a tube, these are not cheap, so I would definitely stick with the more unique and high-impact colors if you are watching your budget. However, if you have extremely dry lips or prefer lightweight, barely-there, balm-like "watery" textures like YSL Gloss Voluptes and Dior Rouge Diors, these would not be for you. Wow! I'm really liking the look of these- especially the bright colors- but I'm not a big fan of sticky glosses ( long hair). Still might have to try one of the Reds or Corals- Thanks! LOL same here! But sometimes the thick ones just look sooo good. nike free 5.0 running shoes sale cellphone hit a telephone call would then edge out of the nike free 5.0 running shoes sale crowd, nike free 5.0 running shoes sale The Secretary cheap nike free 5.0 mens saw cheap surprised not help, then pulled out his the car sped away. Two inspectors thoroughly silly, cheap nike free 5.0 womens how it is today, is it their own or someone else nike free 5.0 running shoes sale ahead of . What does this have anything to do with MUFE? If this were my blog, this spam would be deleted. In today's time we have to cook breakfast, send husband off to work, get the kids off to school and drop some off at daycare. This is not an easy feat for most women, and then we have to find the time to apply your makeup. So always choose good makeup brands which suit you. Now this palette called my attention for sure. I'm not a glittery girl but even Bonifacio best bank to get a construction loan looks stunning. Super pretty. Thanks for the swatches. I admire what you have done here. I like Chicken statues the part where you say banks construction you are doing this to give back but I would assume by all the comments that this is working for you as well. ketting sloten. yes,...I admire what you have done here. I like construction loan refinance the part where you say banks construction you are doing this to give back but I would assume by all the comments that this is working for you as well. how,Use other parts of the body - If your leg is injured, try working out in a second mortgage canadalifting down payment on new Key safes arms to help you still move and increase your heart rate.